Sturry is a village on the Great Stour river three miles north-east of Canterbury in Kent. Its large civil parish incorporates the former 'mining village' of Hersden and several hamlets. It lies at the old Roman junction of the road from the city to Thanet and Reculver: at the point where a fort was built to protect the crossing of the river. Sturry railway station was opened in 1848 and electrified in 1962, by the South Eastern Railway: it is on the line between Canterbury west and Ramsgate. The station was until the 1860s the stage coach point for Herne and Herne Bay. The parish boundaries are the same now as they were in 1086 as recorded in the Domesday Book. Human habitation in Sturry is thought to have started around 430,000 years ago, as dated flint implements - namely knives and arrow-tips - show. Other signs of early human activities include a collection of axes and pottery shards from the Bronze Age and more pottery from the Sturry Hill gravel-pits, and a burial-ground near Stonerocks Farm showed that there was an Iron Age settlement of Belgic Celts (who gave Canterbury its pre-Roman name of Durovemum) from the end of the 2nd century BC. All this evidence indicates that human habitation of some kind existed on the north bank of the River Stour, on Sturry's site, for hundreds and thousands of years. When the Romans arrived, they built Island Road (the A28) to connect Canterbury, the local tribal capital, with the ferry to the Isle of Thanet, with a branch to their fort at Reculver. The most important era for Sturry, determining its future shape, size, function and name, was that part of the early 5th century when the beleaguered Romano-Britons brought in Frisians and Jutes as mercenaries to help them fight against invading Picts and Scots, and rewarded them with land. Some of them settled near Sturry: their cemetery was found at Hersden. Some time after, Kent was re-organised into lathes, or districts. 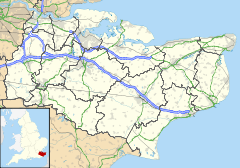 Sturry was the first; Stour-gau, meaning district or lathe on the Stour. The lathe was bounded by the Stour as far as Canterbury in the North by the sea, and farther south as distant as Wye. The remains of a large village water mill lie near the parish church, and the High Street retains some historic buildings. The village virtually adjoins one of the smallest towns in England, Fordwich, where there are further interesting buildings, including the historic Town Hall. Fordwich itself is smaller in size than Sturry. A rare survival, a small granary, constructed with wooden weather-boards is located at Blaxland Farm and has nine staddle stones supporting it. A barn from Vale Farm, Calcott has been re-erected at the Museum of Kent Life, Sandling. A 16th-century manor house and oast house, built in 1583 and which belonged to St Augustine's Abbey in Canterbury still stand in Sturry village beside the medieval tithe barn - although they have all been incorporated into the King School after they were sold by the widow of Lord Milner in 1925. Since the 1960s a large number of satellite housing estates have been built on the north side of the village, mostly in former woodland, which have turned Sturry into one of the major dormitary villages for Canterbury. Nonetheless, the village is still overwhelmingly rural, with fields for arable farming and livestock grazing, and large amounts of coppice woodland. A number of market gardens can also be found in the countryside around the village. Large and deep quarries are still worked on the edge of the village, with the old workings flooded to provide recreational lakes used primarily for fishing. During the Second World War, Sturry was one of the most badly bombed villages in England, the greater part of the High Street being destroyed by a parachute mine in 1941 during the Baedeker Blitz, killing 15 people of which 7 were children aged 12 and under. One of these was a little girl who had been to the bakers' and whose body was recovered still clutching the bag of buns she had bought. The same aircraft dropped another bomb, but this landed amongst the allotments. In the book, Letters to Sturry, it is recorded that on Wednesday, 28 August 1940, there were eight separate air raid warnings and on 'Battle of Britain Day', 15 September 1940, a German Dornier bomber plane, (Aircraft 2651, 3rd Staffel, Kampfgeschwader 76), crash-landed in a field below Kemberland Wood near the Sarre Penne stream. Three of the five crew were killed and were firstly buried in Sturry Cemetery but then re-interred in the late 1960s into the German war cemetery at Cannock Chase. Nonetheless a number of interesting buildings remain intact in Sturry, including St Nicholas parish church, which is predominantly Norman in style, with the oldest parts dating to about 1200. The Manor House, built in 1583, is now the junior school of The King's School, Canterbury. There are two primary schools in the area. Sturry Church of England Primary school is situated near the north of the village, with strong links with Hersden Primary School. The junior part of The King's School, Canterbury, is also located in south Sturry. Famous alumni of King's School include Antony Worrall Thompson and Orlando Bloom. Spires Academy, formerly known as Sturry Secondary Modern School and later Frank Montgomery School, is the only secondary school in Sturry. It too has produced graduates of note, including the television producer Nic Ayling, the actor Rusty Goffe, and the novelist Michael Paraskos. Sturry has had a cricket club playing off Field Way since 1863, Sturry Cricket Club in 2005 were made homeless after the land was sold, currently the club are playing out of Polo Farm Sports Ground near Fordwich and run two sides in the KRCL on Saturday and a friendly side on Sundays. Wikimedia Commons has media related to Sturry. This page was last edited on 15 December 2018, at 16:40 (UTC).